I spent three weeks in Germany (mostly in Halle, but also a five-day meeting in Heidelberg) back in 1997. Lunch was the big meal. We went down the street to the fleischerie, where the meals featured pork, sausage, Kartoffen and/or cheese. After lunch, we’d go across the street to the Handelhaus (G.F. Handel’s birthplace) for a coffee, then back to the lab. By 3 PM, I was ready for a nap–post-prandial torpor. 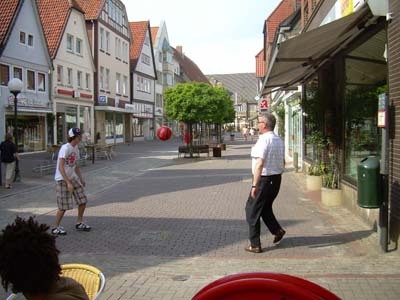 I loved the tidy streets in Germany. A couple years later, I sent my grad student to Halle for two months. Unfortunately, he was vegetarian and lactose-intolerant. If she has time for travel, she should try to spend a day or two in Vienna. Tell her to check out the white asparagus, too.